German Trade Flows Contract As the German Surplus Shrinks; Is Germany Caught Up in the Great Trade Game? German exports and imports each fell in February, resulting in the smallest trade surplus since January 2017. However, both 2016 and 2017 produced a low deficit reading in either January or February so the decline has a ring of seasonal normalcy to it. There are a lot of concerns moving currencies, moving stock markets, affecting bond markets and a war of words embodying threats of action over trade policies are flying to and fro. Christine Lagarde has taken this moment to state that global recovery has taken root. But it is a curious time to make such a statement when so many questions are flying and markets seem to appreciate the degree of risk in the air. I suspect Ms. Largarde’s statement is meant as a palliative. But it is only words and has no action behind it. Meanwhile, the Trump/Xi exchange has real adverse policy actions set to be put into play on its rhetoric. To me, the Lagarde statement looks like something that could backfire by getting people to worry about why the IMF thinks it needs to send out such a reassuring message. Are things really so bad that we need to convince people that they aren’t? We may never see these talked-about tariffs put in place. But regardless, the risk is there. The U.S. desire to get China to end its unfair and anti-competitive and actually predatory polices is now quite clear. After years of countries playing the game of ‘Let’s Pretend’ on trade, suddenly the veil of obfuscation has been removed as though everyone just ducked out from under Maxwell Smart’s ‘Cone of Silence’ and instantly could hear the truth. The perception of Donald Trump is still adverse, but more and more nations and regional entities now see the wrongs he is trying to right. There are other suggestions as to how to pressure China rather than to use tariffs. In the end, I don’t think it matters because China is not a fair negotiator and is not swayed by the truth. Maybe ‘might makes right’ in dealing with it? China grabbed the South China Sea and would not give it back when the world court and world opinion turned decisively against it. That’s how China operates. China still gets aid as an underdeveloped country, because that’s how China operates. And China is spreading its own aid across the global to build up good will and to try to get countries to side with it when it makes its outrageous claims. It’s the kind of world we live in. China, the massive polluter, endorses the Paris Climate Accord and tries to rehabilitate its image and make the U.S. look like the pariah. Who is China fooling? The world of ‘fake news’ has never been more debilitating. Let’s face it there is a lot of policy manipulation in play and the risk of some sort of confrontation with China is high. Barack Obama was deferential and not hard-nosed. He was never going to try to shake up China and to protect American interests there. Many are angry at Trump for stirring up the hornet’s nest. But why accepting that state of affairs as reality, just because China is stubborn and because U.S. firms operating in China had mostly found a way to make this system work for them? How has it worked for the people back in the U.S.? Not so well. 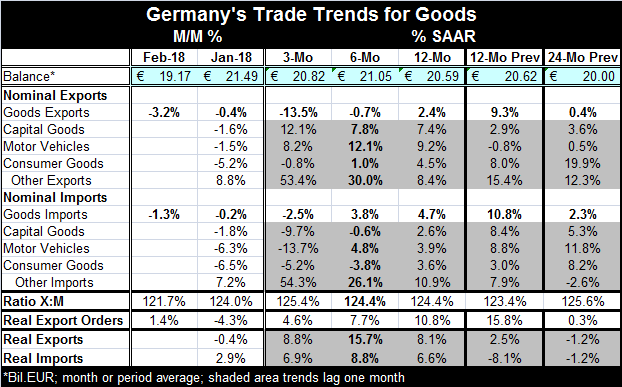 As a consequence, there are a number of new threats that find a weak Baltic dry goods index, weakening (but still high-valued) PMI indexes for Europe; there is weak consumption in both Europe and in the U.S. And in such an environment, it is not a good idea to imply that an unexpected bout of German trade weakness is something that is probably just seasonal- although that still may be true. German nominal exports and imports are slowing from 12-month to six-month to three-month. But on data that lag one month, German real trade flows are more stable and lack the slowdown trend. German real export orders continue to point toward export expansion. But real export order growth also is slowing down. On the evidence, it’s hard to tell if German data are significantly weakening or not. Also in today’s news, there was a relatively sharp drop in the Sentix confidence index; that euro area investor confidence indicator fell from a level of 24 in March to 19.6 in April. The trade spat is taking its toll. The Middle East is as hot and volatile as ever with Trump planning a pull out form Syria then deciding to stay; the U.S. presence there is no longer certain. Then there are allegations of a poison gas attack - just the ticket to keep U.S. troops glued to the area. Russia says there is no evidence of such an attack. Israel is blamed for a bombing run of a military base that it has claimed houses Iranian forces in Syria. Israel has not responded to the charge. The UN is supposed to meet over allegation of the poison gas or chemical attack. China is now said to be looking into currency devaluation as an option for retaliation. This trade spat has turned into a global board game of possibilities. Who will roll the dice next? Currency fiddling is not going to be a way out for China. China really needs to turn over a new leaf and learn to trade fairly. It needs to realize also that trading through SOEs will always mean that it will be subject to concerns that its firms are getting unfair advantages in treatment, support and financing. The problem faced now is not about what’s wrong. It is absolutely 100% clear what is wrong. What is black-as-night-opaque is how we can evolve from where we are, mired in this global conflict, to a resolution. There is no objective sense in which China is ‘right.’ China is also a ‘sovereign nation’ and its leaders are very proud and stubborn and they will need a way to save face if they do back down. I can’t imagine what it will be like if they don’t back down. Trump may know the ‘Art of the Deal’ but we know he does not know or understand diplomacy. That could be his – and our- undoing. Every conflict needs a resolution. Trump found it easy to engage more in Syria; he is finding it much harder to disengage. With China I hope that the same thing will not be said. Disengaging is how you close the deal on trade.